We haven’t seen you for a long time at the table. Why did you not visit Worlds? – I wish I could live in Europe then I could attend all the competitions in the world and would not have missed even one. As armwrestling is not an affiliated sport and therefor government does not support us. 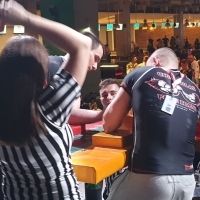 Even for sponsors it’s difficult to sponsor me, because if I go to a big company they ask if armwrestling is an affiliated sport, when I say “no” they say they can’t sponsor. If I go to small company they say there is no use sponsoring me as it’s too far from South Africa for them to make it worthwhile for them to sponsor me. Why did you decide to come to Zloty Tur this year? What result do you want to see? – I want to compete again internationally as 2015 was my last international competition. And what other competition is better than Zloty Tur? I feel great I think I am in a good shape to make the podium again this year. I will definitely compete in 105kg class. Toughest rival? Well it depends on who will be there. Will you come to Rumia alone or with team? – So far we are two maybe three athletes who will attend Zloty Tur this year. Me, Alma du Plessis and maybe Lee Smith. Still waiting to hear if Kevin will join us. But I have very high hopes for Alma, who will compete this year as she is a phenomenal armwrestler. I call her super woman. As she beats most of man armwrestlers in my club. Speaking about Vendetta All Stars, who do you think would be the strongest in pairs? – I think all armwrestlers are phenomenal armwrestlers but it is very difficult to choose between these two legends. Speaking about Babaev vs Hutchings, though Rustam is very strong in hook, I think Todd will be victorious.